I use AA batteries for a few of my digicams and for all of my electronic flashes. When I have a big event, I can go through 6 sets (of 4 batteries) in a shoot. One of my frustrations is that, if I haven't used a set of NiMHs for a few weeks, the batteries can be partially drained when I put them in the device, giving me only half the shooting time compared to a freshly-charged set. 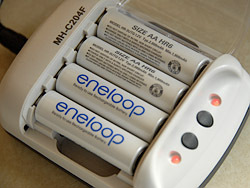 According to Mike Pasini over at Imaging-Resource, Sanyo's new Eneloop AA NiMH batteries have "a new super lattice alloy which increases the electrical capacity of the battery, reduces the internal resistance and allows higher discharge currents -- all good stuff in a digicam." Mike and company get into some good battery specs in the article, and it's worth taking a closer look to learn what an improvement these new cells are. And the best news? You can buy a kit of 4 batteries and a charger for about $20. If you already have a NiMH charger, you can buy the batteries alone for for just $9 a set. What a great stocking stuffer for your favorite photographer (even if that's you). Back in March 2006, I reviewed the Huey colorimeter and was lukewarm about its performance. Even though I loved its price ($80) and thought is was a snappy looking device, I wasn't sold on its screen calibration ability. Well, I pulled it out of mothballs the other day, downloaded the latest driver from Pantone, and tried it again on my MacBook Pro. It worked great. And the profile the Huey created seems spot on. I retested again and got results that were just as good. Graphics tablets are great tools to help with detailed image editing in Photoshop. They can be pricey, however. Fortunately, Wacom has released the Bamboo line of tablets that start at $79 US. PhotographyBLOG had just published a review of the Wacom Bamboo tablets that will help you decide if it's time to add this device to your image editing workflow. We've talked about extreme glass before on The Digital Story. In this article Ben Long says, "If you have a digital SLR, but haven't yet explored the world of unusual lenses, you're in for an eye-opening treat." Ben then takes you on a tour of fast, wide, fisheye, lensbaby, and tilting lenses, with photo examples for all. 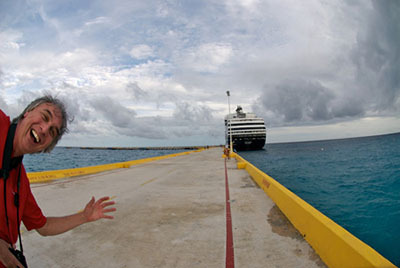 He captured this shot of me in Mexico with a Nikon 10mm lens, a wonderful piece of glass he discusses in the article. If you're a Mac shooter and have been curious about incorporating digital picture frames into your display options, PhotoVu has now built-in compatibility for the Mac. PhotoVu frames come in a variety of sizes (10" - 22") and have beautiful screens that show your work in the best light possible. One might make a nice holiday gift for the Mac photographer in your family. Thinking about the perfect digital camera for Mom, your friend the serious enthusiast, or just an all around snap-shooter for the family? Then you might want to hop over to Imaging-Resource.com and take a look at Dave's Picks. He gets straight to the point, listing his favorite cameras in each category, then providing links for you to learn more about the models you're most interested in. Even if you're not in the market to buy, it's terrific window shopping. "Workflow" is the kind of word that makes most hobbyist photographers cringe. But the fact of the matter is, if you've taken great photos with your digital camera, don't you want to find the easiest way to organize them and share with others? If this sounds appealing to you, then you might be interested in my workshop this coming weekend titled, I've Taken Great Photos, Now What?. You'll learn about the coolest photo management applications including Adobe Lightroom, Apple iPhoto, Photoshop CS3, Photoshop Elements 6, and Apple Aperture. We'll build a workflow tailored specifically for your needs. And by the end of the day, you'll see that managing your images can be as fun as taking them in the first place. The workshop begins at 10 am on Sat. December 1 at 1678 Emeritus Hall, Santa Rosa Junior College in Santa Rosa, California. You can sign up for the class online, or call for more information at 707-527-4372. The course fee is $63. Photo of Derrick Story teaching on a recent Geek Cruise taken by Randal Schwartz. I've posted an underwater gallery from my recent trip to the Caribbean on a Geek Cruise. All of these images were captured with a rig that costs less than $500 US. I don't like to use flash underwater (none of the images in the gallery used supplemental light), so I'm always looking for clear water with interesting landscape and fish. That way I can shoot in relatively shallow depths--often less than 10 feet. Having a camera with image stabilization is very important. Everything is moving underwater, including you. 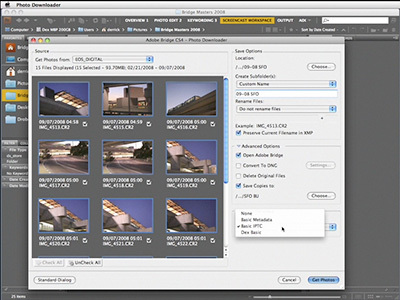 The image stabilizer minimizes the effects of camera movement during exposure. I also increase the ISO to 400 to enable as fast a shutter speed as possible. And don't forget to use the camera's Underwater scene mode if it has one. It really helps with the white balance setting. Once I'm out of the water, I still have some correcting to do in post production--most of it is levels and white balance adjustment. The good news is, once you figure out the adjustments you want, you can apply them to most of the shots from the day. 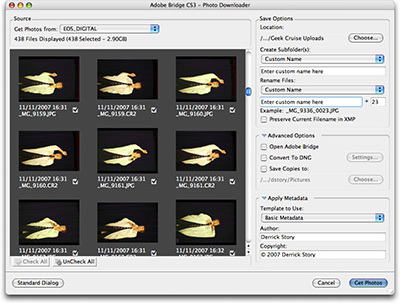 Features such as "copy" and "paste" in iPhoto or "lift" and "stamp" in Aperture are real time savers for these types of assignments. I also recommend that you get your own snorkel and mask if you plan to take up this sport. That way you know you'll be comfortable while diving. I have my own fins too, but they take up a lot of room in the suitcase. So I usually leave them at home when flying and use the fins available on the dive boat or for rent at the destination. As with any type of nature photography, be very respectful of flora and fauna. Don't touch the coral or harass the fish. They will come to you out of curiosity if your body language is non-threatening. 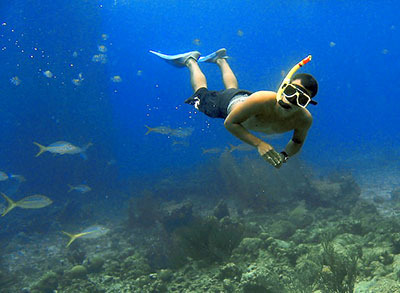 Underwater photography is a terrific way to spice up your image library. I like the exercise I get with a good swim, and then you can celebrate your "catch" with a cold rum drink or two while relaxing on the beach afterward. Photo of skin diver by Derrick Story, captured in Curacao with a Canon SD700 IS in a WP-DC5 underwater case. Most of us have "legacy" content that we would like to digitize: prints we laboriously perfected in the darkroom, slides that we exposed with the utmost care, and family mementos from previous generations. In other words, a good, versatile photo scanner is required equipment these days. The Epson Perfection V500 Photo Scanner is a flatbed scanner capable of producing 13" x 19" enlargements from your 35mm slides (6400 dpi), uses LEDs for its light source, and includes Digital ICE to help eliminate dust appearing on your scans. All of this for $249 USD (or less). PC Mag gave it an Editor's Choice for photo scanners, and the Amazon ratings are either love or hate... the hate stemming from slow scanning speeds (which wasn't noted by PC Mag). Seems like the bottom line here is... that if you want terrific quality for an affordable price, and are not in a production environment, the Epson V500 is a good choice.